Pär has played with and done konserts with: Nobel price winner Tomas Tranströmer & famous swedish poet Pär Lagerkvist. Pär has played with world famous trumpeter Maurice André, world famous oboist Han de Vries, and has also performed with Orchestra de Paris. 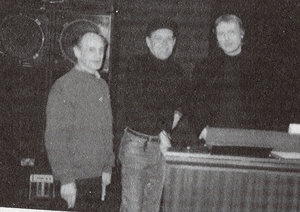 In 1993 Pär was introduced to Lee Jacksson in Los Angeles by Will Alexander. 1994 they met again in England as Pär made an interview with Lee. 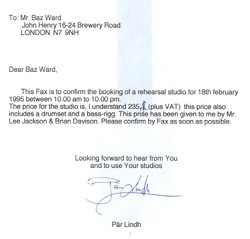 In january 1995 Lee called Pär over the phone to ask if he was interested in formning a band. Pär said who would be in this band and Lee replied well Brian Davison is sitting next to me right now and are up for it! So Lee and Brian Davison would be interested in getting a band going again and it was decided over the phone that Pär would join in on keys to create sort of a rebirth of The Nice or Refugee. At the time Pär was looking for a band to perform his newly released album Gothic Impressions so it seemed like a good idea for all. In february Pär went over to London for a first rehearsals and the three players enjoyed these sessions very much. The songs that were played were from Pär´s side Baroque impression, Jazzeruption, The Cathedral (they got about eight minutes in to this 20 min piece) and a Swedish folksong ¨tune from Utanmyra¨ which Lee just loved! From Lee and Brian´s past were played great versions of Rondo and Hang on to a dream. Pär got a Swedish festival gig summer 95 going if only he could find a band to perform his progressive hit album Gothic Impressions with. He suggested that he would play with Lee and Brian and the festival people loved the idea. 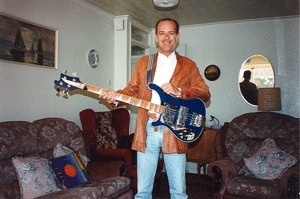 Through the old Nice roadie Mr. Baz Ward Pär rented a rehearsal studio at John Henry´s in London for a weekend of hard work getting a concert program ready for the Swedish festival later on that year. It was a wonderful time for all as the three musicians got on really well and played compositions by Pär as well as some old Nice classics like Rondo. ¨I remember when we had played Hang on to a dream Lee with a tear in his eye afterwards said that he had not sung it in over twenty years! I looked around and there was tears in everyone elses eyes as well ¨. Also a Swedish folk song was rehearsed which Lee really loved. The band was now ready to get out and play! Unfortunately the fee from the Gothenburg Artrock Festival (although O.K. by progressive rock standards at that time) was considered to low by the band considering they had to travel from England and all. Pär offered to play without a fee and called the organisers to raise the fee just a bit to make it all possible. But sadly enough it just wasn´t meant to be. Pär´s newly started record company Crimsonic Label had only released one CD at the time and although Gothic Impressions sold very well the company didn´t have to much cash to spend on new adventures. Says Pär ¨I just realised that I couldn´t take the financial risk of promoting a band with Brian and Lee at the time which would have included a lot of travel costs back and forth from England to Sweden etc. So in the end I wrote Lee & Brian a very honest letter to explain the situation for them¨. ¨Nice¨ chaps as they are they understood the situation. In the fantastic book ¨Hang on to a dream¨ by Martyn Hansson Helter Skelter publishing there is a short passage about these events in the history of one of the first (1967!) 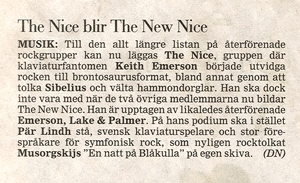 truly original progressive rock bands ever… The Nice. ¨Pär impressed us both with his ability, but it was no to be¨.